In a bowl beat them, with the help of the blender, butter with the two types of sugar to form a homogeneous mass. Add eggs and beat again until everything is integrated. Mix the flour with the baking, vanilla and salt, and add all, as we gradually beating, the previous mass. This step will take a few minutes, we must ensure that no lumps. A previous mass add the chopped peanuts and chocolate chips, and knead well to be distributed homogeneously. Roll into balls (I made them a little big because I wanted to leave a larger cookies) and we are placing on a baking sheet lined with parchment paper, considering expanding a lot in cooking (quite separate, therefore). Bake in the oven, preheated to 180 º C, for about 10-12 minutes. As of significant size, I left them 12 minutes but, as always, to the size that you choose for your, must take into account “how it works” your oven. 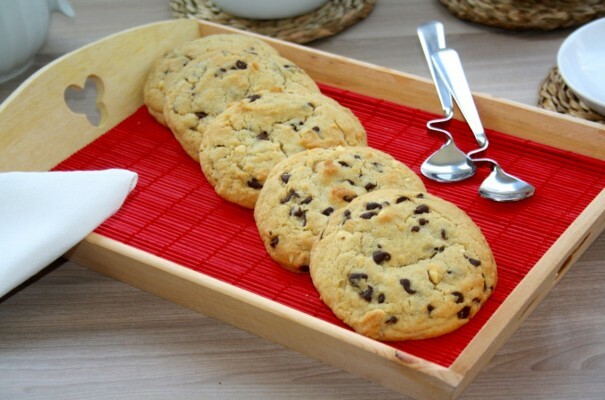 Once out, we let it cool before moving on to enjoy these delicious cookies. 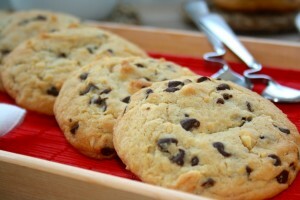 I hope you liked the recipe, and to do them because you animéis these cookies do not resist one!, you'll see what good. I tell you, and to complete, started in my house these days and times of birthday celebrations, so in the next recipe I am going to talk a lot of sweets such occasion… so, if you have family parties in sight, Do not miss even one of the recipes!. See you soon !! I have been sure they were precious and… because they are no longer safe, or other???? I love chocolate with peanuts, I lose. And after all this hard to better the return to routine, meals for the uncontrolled, times, Departures, leaves me exhausted. 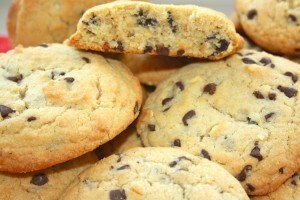 A few days ago I made my first cookies, after success and see how easy they are…I note these yours. Encar, I have never made with peanuts, but seeing the'll try your recipe. You look great, at this time with a coffee, you see not so rich snack. A kiss. Ellen, prohibited them until you finish the diet !! Mother, that last, This brings me back to my crazy friends and their babies safe! 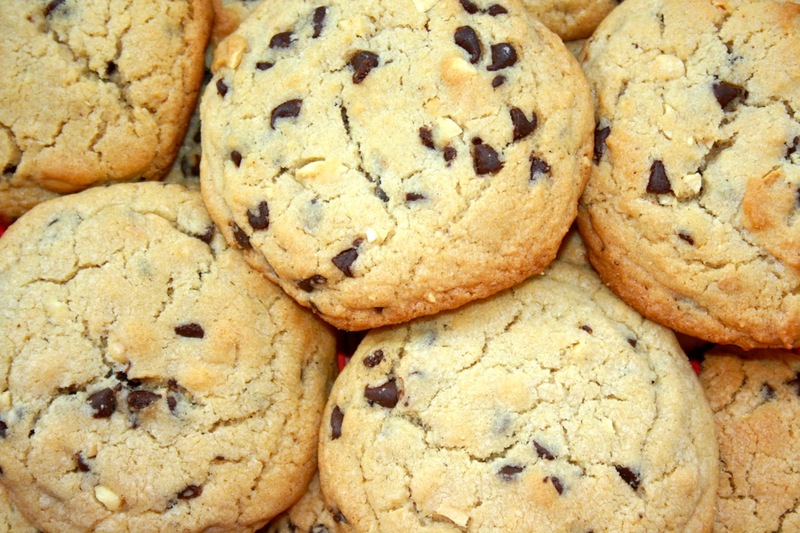 I made them once, no peanuts, and were very good, I see yours but much nicer. 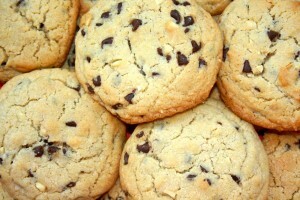 The truth is that I see and I love cookies, but then I'm too lazy to prepare, is one of the things that make me hard. Kisses. I like a lot this kind of biscuits, so I'll have to try to make these peanuts. They must be very rich…. the look is sensational. I am delighted to be in your kitchen. These Gallenteans must be delicious because they have a pint… god now I ate a few! haha sure the peanuts on top adds a rich rich! A pint of which do nothing but get hungry photo, I want them, but I have a question that maybe you look stupid. Where do I get chopped peanuts and chocolate chips? Seeing your recipe and made me anime!! But I have a question, flavor came out great but I plan on biscuits instead of cookies, any trick to avoid that happens? Cupcakes ?? you mean you went soft ? If so, is rare, if you put the temperature and time indicated. And if so would be very cooked either inside, no?.. Maybe they do need more time cooking in your oven, I understand that there is an air oven and heat up and put down, and the tray in the middle of the oven.. This cookie is not hard and a bit chubby, you see in the picture cut, but the outer layer does have a crisp point, and nothing to do with a biscuit, clear. I do not know if you clarify something, if not, tell me and see what could happen.. Maybe you made them too fat?